The Handiest RV Gadget Ever! We are long time RVers. When our kids were young we started out with a tent trailer behind a Suburban, then we graduated to a Class C. When our kids started losing interest we downsized to a pop-up truck camper. We soon found that to be a little tight with a dog so we upsized to an 11 ½ foot truck camper. And now, with two dogs, we enjoy our Class A. Regardless of the rig we were in and wherever we went, we found ourselves always looking for a good place to hang our wet swim suits, towels, wetsuits, fishing waders, laundry, birdfeeder, and anything else you can think of to hang. Invariably, we did like everyone else. We hung stuff on our awning arms, the rig’s mirrors, camp chairs, or on nearby trees or bushes. We didn’t really like looking like hillbillies but hey, we didn’t have much choice. When in fancier RV campgrounds we found that most of them even have rules against hanging things on their trees, fences or hook-up stations. When we shopped for RV hangers we were disappointed that available offerings which mounted on the ladder would render it unusable. On top of that most of the products out there, whether mounted on the ladder or on the bumper are, well, let’s just say “less than attractive”. We had also come to learn that many RV products are so cheaply built that you’d be lucky to get one or two seasons out of them. That’s when we decided to take matters into our own hands and we designed the Ladder Gadget. From day one we were determined that if we were going to make something, it would be built like we would want it for ourselves…. Built to Last!! And by Built to Last, we envisioned it to last not two, three or even five seasons but to outlast your RV! After a lot of thought about ease of use, practicality, and durability our final design was ready. Built using high grade anodized 6061 aluminum and stainless steel hardware, Ladder Gadget may just be the sturdiest and handiest RV accessory ever! And hey, it even looks pretty cool too! Take a look at our YouTube video and our Gallery of Uses and you will agree! 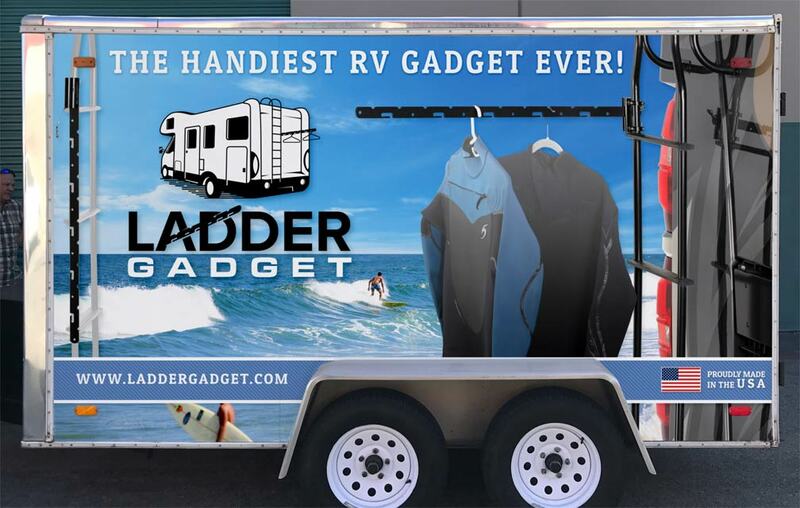 Thank you for considering Ladder Gadget for making your best RV adventures even better! !